The Red Chair Blog: Dollar Tree...Literally! 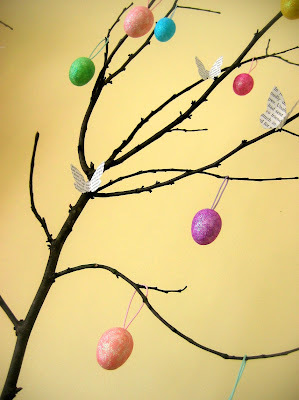 If you've got a dollar and some basic craft supplies, you can "grow" a sweet little tree to celebrate spring...or "pre-spring" as the case may be! 1. Remove the lid and the label from the oatmeal container. 2. 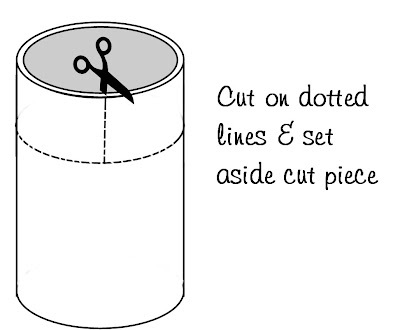 Following the illustration below, cut a strip off of the top of the oatmeal container. Set that strip aside for later. 3. 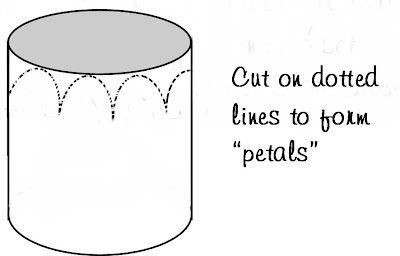 Cut "petals" and then fold them down. (The deeper the cuts are, the more easily the petals will fold down.) 4. Cut a piece of floral foam (or Styrofoam) so that it fits snugly inside of the oatmeal container. (Tip: a serrated bread knife is helpful for cutting foam.) Depending on how snugly the foam fits, you may or may not need to anchor it with a blob of glue. 5. Anchor the branch in the foam and top it with floral moss or shredded paper. 6. Tuck the cardboard strip (the one that you cut in step 2 above) along the inside rim of the oatmeal container. 7. 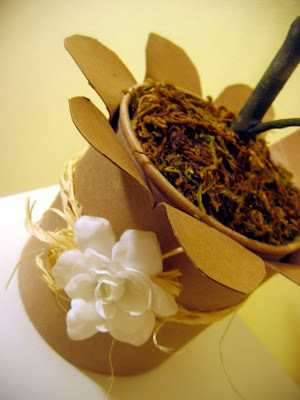 Tie raffia around container and use hot glue to attach a silk flower. I used a gardenia. 8. 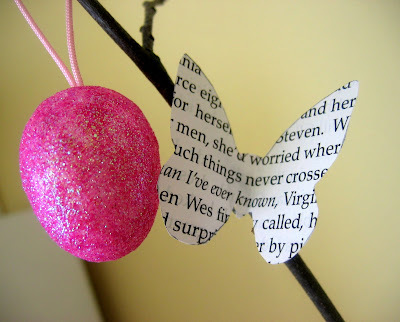 Decorate your "tree" with egg ornaments and butterflies cut from book pages or sheet music. This project was tough to capture on film--it's much more charming in person! 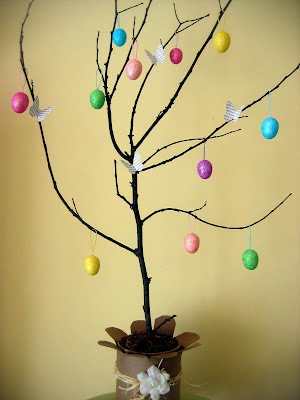 With some modifications, you can use this little tree to decorate when you entertain for a number of different occasions. Replace the eggs with baby booties and you'd have a sweet decoration for a baby shower. 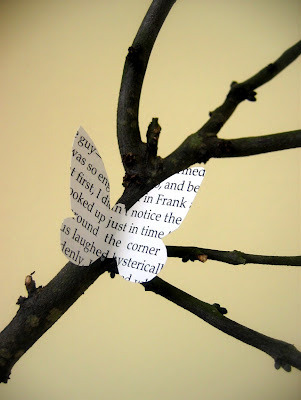 Add a few more butterflies to decorate for a bridal shower or even a casual wedding reception. Looking for more branch-based projects? 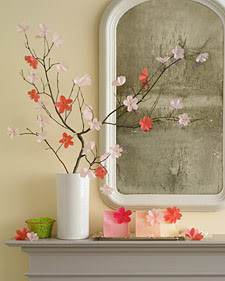 Martha Stewart offers instructions for these pretty paper cherry blossoms here. This post was inspired by the 5 Dollar Challenge at Living With Lindsay and has been linked to Sew Dang Cute, Tatertots and Jello, The Shabby Chic Cottage, Fireflies and Jellybeans, Reinvented, It's So Very Creative, Today's Creative Blog, The Thrifty Home, and A Soft Place to Land.